Attendees will gain exclusive insight into the future extension of the Job Routing toolbox with the option of integrating signature workflows and creating legally binding electronic signatures and seals. Namirial will present new options for the legally binding signing of contracts enabled by EU Regulation 910/2014 (eIDAS). Jobrouter partners can learn for example how they can stay compliant and fulfill Know Your Customer (KYC) requirements of when legitimizing new customers of banks and insurance companies according to Anti-Money Laundering Directives (AMLD), conclude contracts with partners and customers electronically or how they can conclusively create and send invoices with electronic seals of their organizations. Namirial also provides in-depth information on the possibilities of using electronic signature services in a public or private cloud or deployed in their own organisation on premise. The JobRouter Group is the manufacturer of a cross-industry low-code digitization platform. Jobrouter serves more than 900 customers of all sizes worldwide, most of them through its 160 partners. 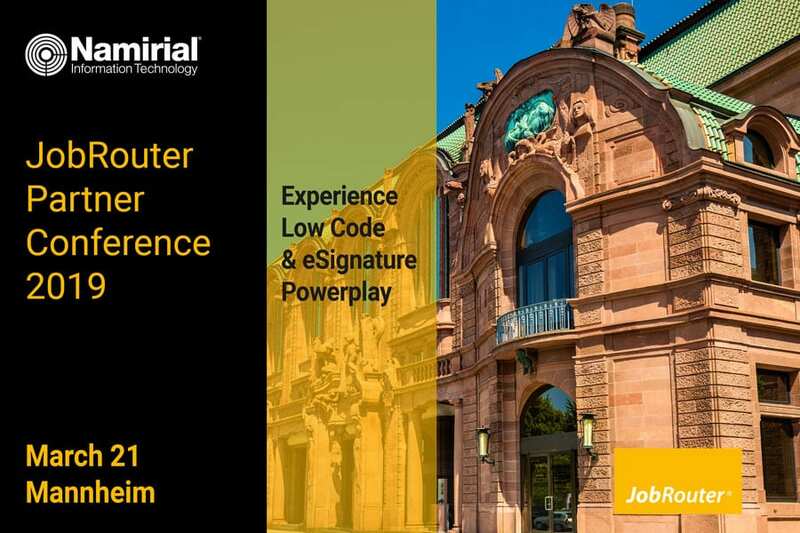 Namirial will be represented for the first time at the annual partner conference in 2019.